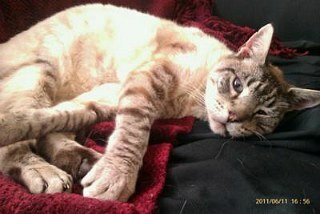 Recent visitors have asked for help in identifying their adopted or rescued cat's color or breed. Rescue cats tend not to come with the kind of pedigree or registration papers that tell you who your cat's parents were (and their parents and grandparents) and without knowing this, it's hard to say exactly what breed of cat you have. 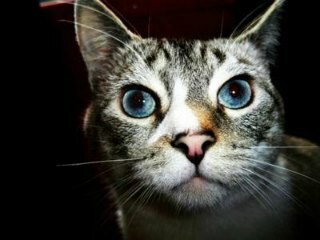 The most anyone can do is to give you a 'best guess' based on your cat's coloring, coat, eyes, ears and other distinguishing features that would help to place your kitty into a particular breed. This becomes very difficult when you don't have the cat sitting in front of you, and are trying to identify the cat from a picture! That said, we'll try and help out some of our visitors who all asked, in various ways, "what breed is my cat?" 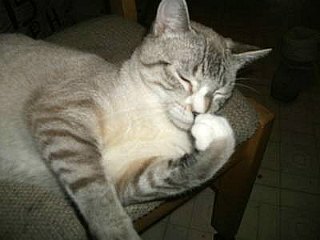 Let's see what kind of cats we might have here. The first two were sent in anonymously, but I hope their owners stop by to see their kittens in print! Q: What color is my cat? Yesterday I adopted my cat. She is one and a half months old. I love her so much, the vet told me she is a seal point Siamese. I am wondering how she will look when she grows up. I agree with your vet. Your kitty does look like a seal point. Her tail is already a very dark brown, and it's likely that her ears, nose, and paws will get darker as she gets older, too. In body type, she looks like what is sometimes known as an old-fashioned Siamese because her ears are upright – in modern Siamese kittens the ears would be set more at an angle. 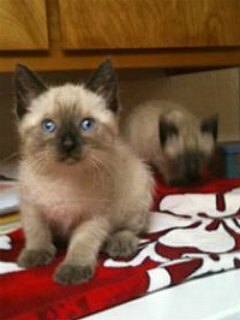 There are several adult seal points shown in the Seal Point Siamese Gallery that will give you an idea of what your kitten will look like when she grows up. Hi ... I think this kitty is too fluffy to be a true Siamese. Siamese have short silky fur. 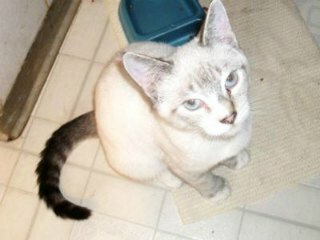 Jenny could be right, this kitten is fluffy and does have quite long hair for a Siamese. Long hair occurs naturally in some Siamese litters, and these cats would then be known as Balinese, not Siamese. Q: What kind of cat do I have? I know that she is a mix but I was wondering if someone could narrow it down for me. 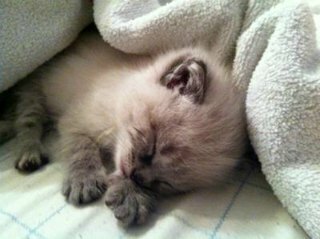 Your kitten is still very tiny, and in Siamese-type kittens it can take a while for the eventual adult coloring to come through. I think she may turn out to be a blue point. Her paws look gray-blue in the photo. And is there some striping on them? If so, she could be a blue lynx point Siamese mix. It's difficult to say for sure until she gets a little bit older - why not come back and post another photo of her then? Q: What breed is my cat Kasa? I think my cat might be a lynx point but I am not sure! Does any one know what breed he is? He has some strange habits! He has to scrape around his food dish after eating, and when sitting under a stool he drapes his arms over the bars. A: A lynx point ... but what else? Kasa's definitely a lynx point. Any Siamese-like cat with stripy legs and tail, and an 'M'-like marking on its forehead would be called a lynx point, also known as a tabby point in some countries. Kasa's coloring looks different in the different photos. In the two earlier ones, he looks very pale, in the close-up above he looks very dark, and in the final picture below, he looks lighter again. I changed my mind several times over his color, but in all the pictures, the tone is gray/blue, so I think he's probably a blue point. Kasa has white paws and a white upside-down V-shaped marking on his nose. This means that he could also be considered a Snowshoe. Put this all together, and what have we got? 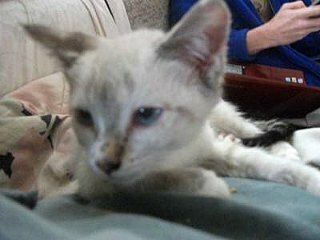 I think you could probably call Kasa a blue lynx point Siamese/Snowshoe mix. Q: Are my baby boys Siamese? I recently adopted my two boys Yves and Lucien from a woman whose Siamese cat had just had a litter. The mother was long-haired with very dark points, stunning blue eyes and a caramel torso. The father had blue eyes but very light points and a white torso. He also had a white nose and white paws. Lucien's eyes are more straightforward. Are my baby boys Siamese? What color would they mature to? 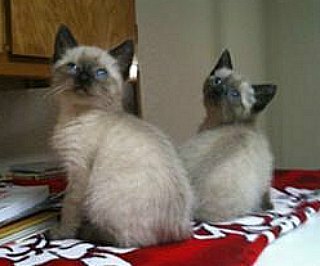 Yves and Lucien have the round faces of applehead Siamese kittens and look as if they are Seal Point, in color. Their mother, though, being long-haired, sounds more like a Balinese. The true Siamese cat breed is short-haired - long-haired Siamese are called Balinese cats. Have the kittens inherited their mother's long hair? They look quite long-haired in the photo. Do they have fluffy tails? If so, they are Balinese. They don't seem to have inherited their Dad's white nose and paws (which would have turned them into quite a different breed, the Snowshoe). Q: How old and what kind of cat is Cappuccino? I first noticed Cappuccino every time I parked my car and walked to the house. Being very vocal, he soon had me in a conversation, which a few days later opened the doors to my home. I am not sure how old he is, or what type of cat best describes him. I hope someone can help determine his approximate age and type. Thanks! To be honest, it's not possible to tell how old a cat is from a photo, but because he looks as if he might still have some growing to do, he could be a young adult. A vet could give you an approximate age and tell you whether a cat is a 'young adult' (under six) or a 'mature adult' (over seven) which they do from the cat's general physical condition and the state of their teeth. So if you need to take Cappuccino to a vet, be sure to ask, as your vet will be in a better position to judge. Cappuccino has gorgeous tabby markings on a cream-colored coat. His markings are striped, meaning that he's a mackerel (stripy) tabby. Cappuccino's eyes look yellow, so he could be an Oriental Shorthair. Cousins of the Siamese, these have the Siamese body shape and other features, but not always the Siamese blue eyes. There's a picture of an Oriental Shorthair tabby at the bottom of this page. To find out more, types of Siamese cats and Siamese cat relatives are good places to learn about Siamese-looking cats. It's perhaps simpler to identify a cat's color, but even then, within the Siamese family, there are so many! 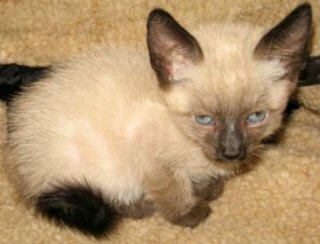 Siamese cat colors will tell you more about these. I rescued this little guy from a boat launch at about three weeks of age. He is now about seven weeks. Curious if he's in the Siamese family. He has a longer coat and a fuzzy undercoat. Either way he is the most cuddly lovable kitten. His name is Mako.